There have been 63 images uploaded to this topic. (View topic image gallery). There are 106 posts in this topic. You are on page 1 of 3. 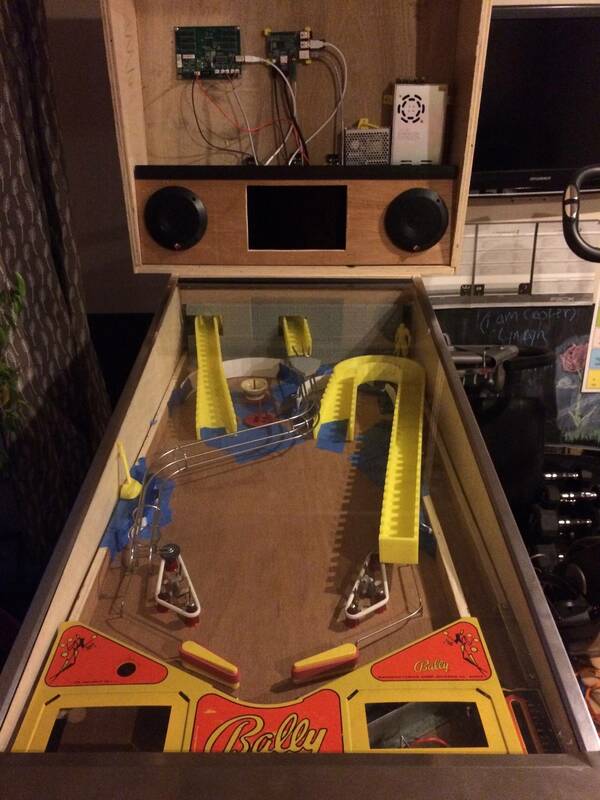 I (along with my 2 kids) have been working on a homebrew pinball for a little while now. Its not near completion (and not even close to as nice as some of the others) but I figured I would post it to at least let others see it. 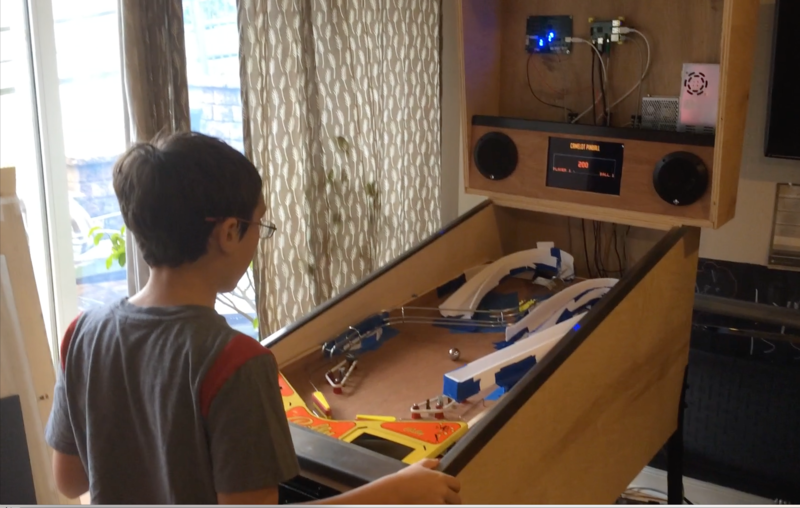 The original idea was to get the kids involved to teach them about electronics , woodworking, 3d printing, CAD, programming, and the overall design process. We actually started with the boards and the programming. 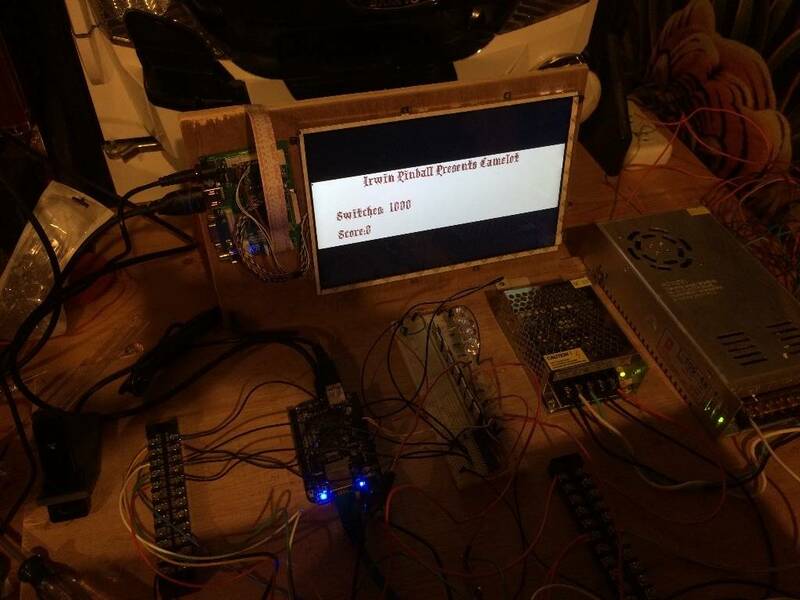 We used a raspberry pi (then moved to a beaglebone black) driving some mosfets via some MCP23017 io extenders. We started with a breadboard before creating our boards in fritzing. We wrote a quick front end in python. 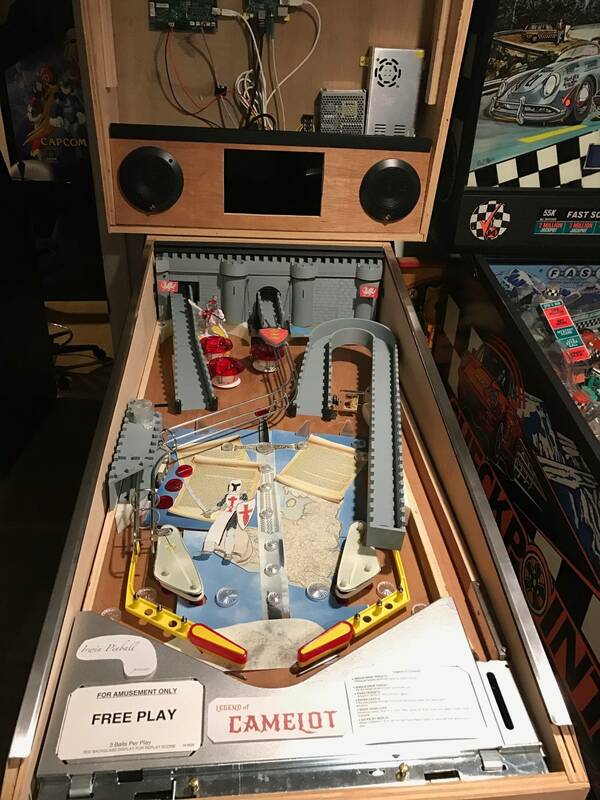 My 12 year old created a design in future pinball and we translated it to the playfield..
At this point we at least had something playable. matirwin last edited this post 2 years ago. 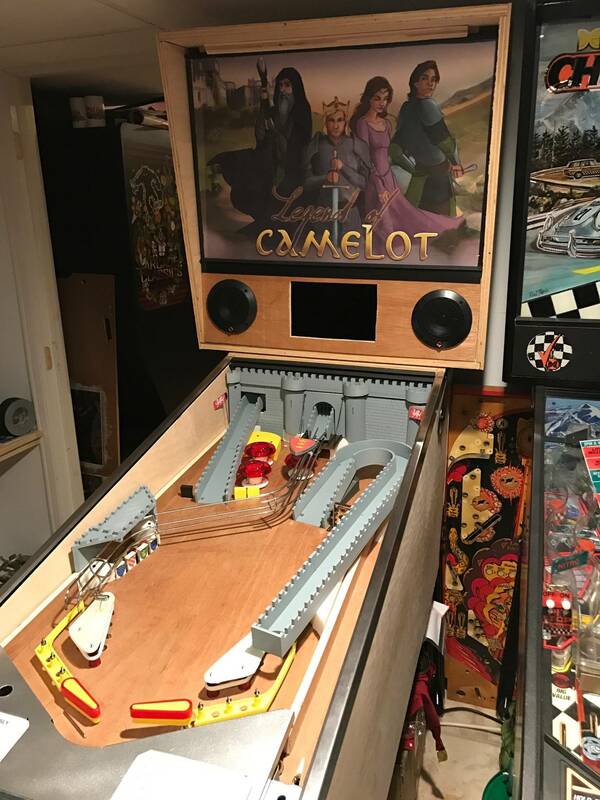 Moving on from our initial play field on sawhorses greatness, we decided to get started building a cabinet. 50$ in plywood later. 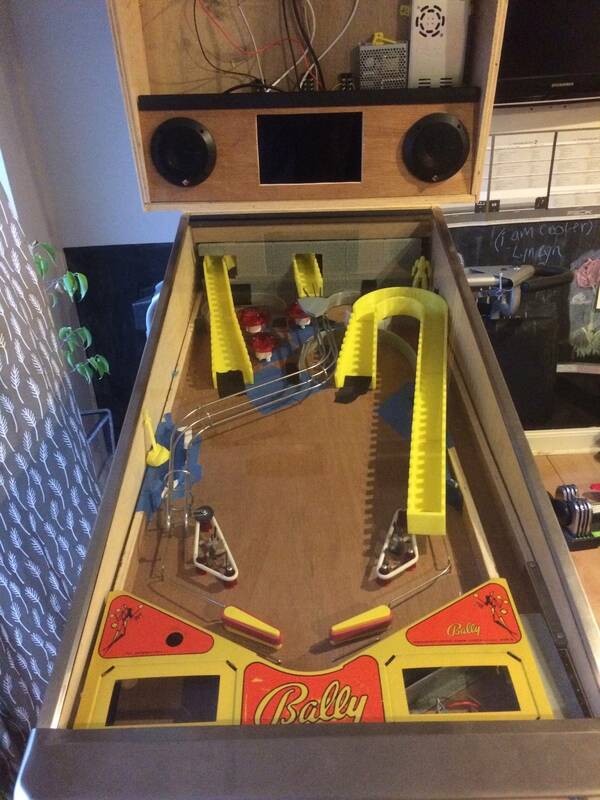 (plus some stuff I had lying around) we at least looked more like a pinball machine. We also quickly decided that although our boards worked to drive the coils. (ok well the slings mostly) and register the points (again from the slings) there was some random interference on the I2C bus. Happy that the kids learned at least some basic electronics (and partially too lazy to sort that out) , we decided to move to a p3-roc board combo. Now we had something that represented what we wanted shot wise (adding the right ramp shot) we decided to start working on the ramps. 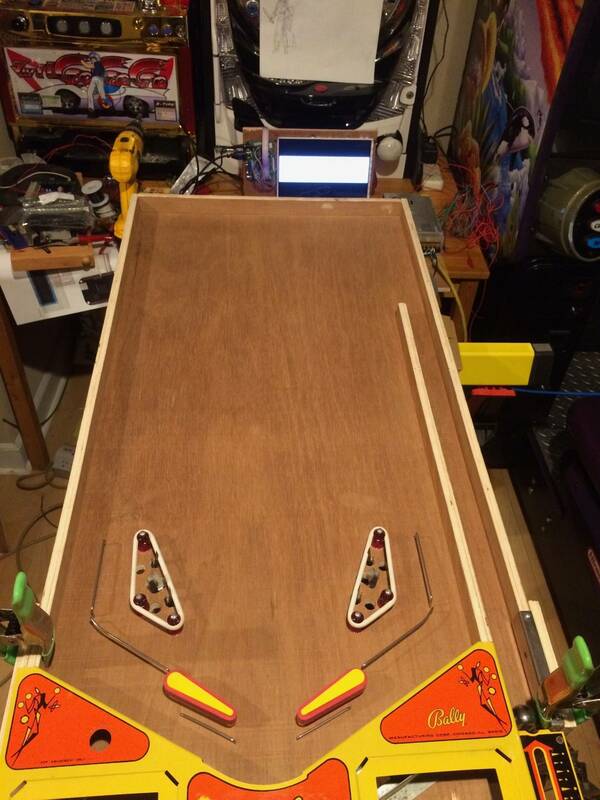 We (and still are) were torn between vacuum forming the ramps and 3d printing them. We decided to go the 3d print route. 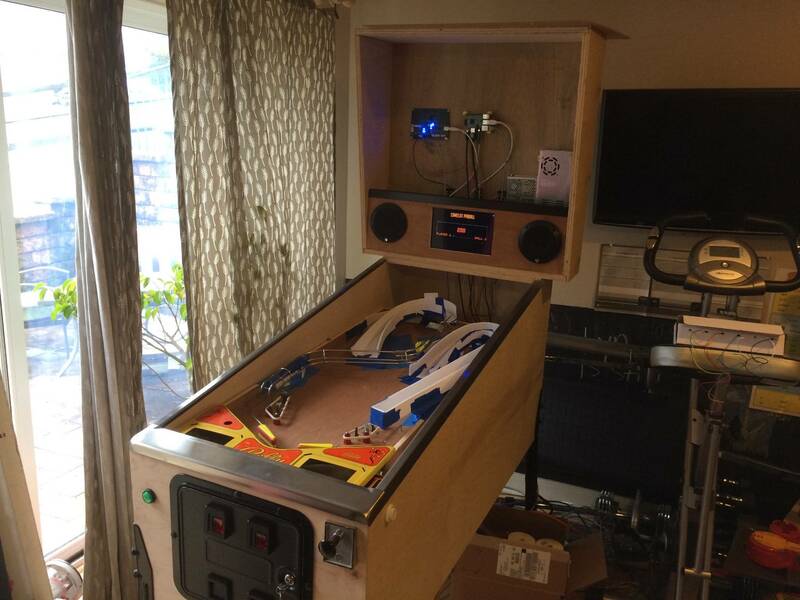 I have a printrbot play with a the extended bed modification. 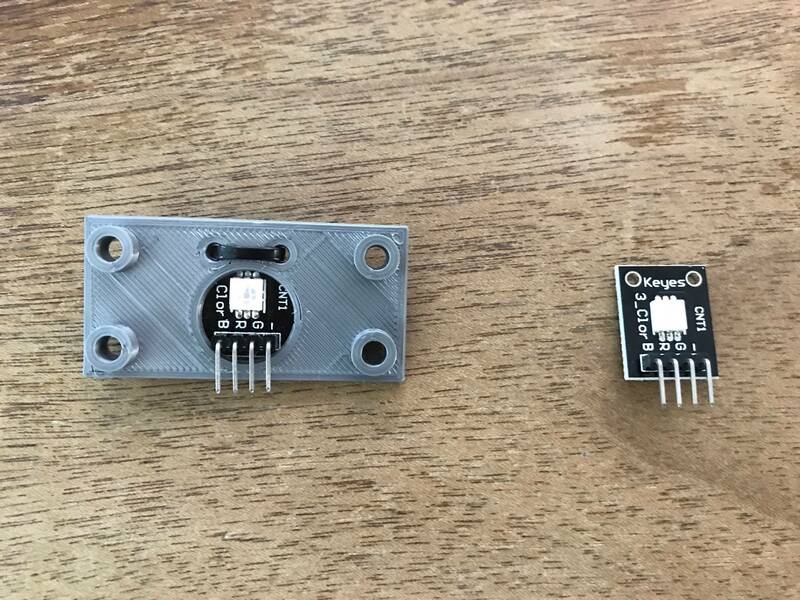 We are very limited to size but were able to start printing the parts. We even slid in the glass for effect. 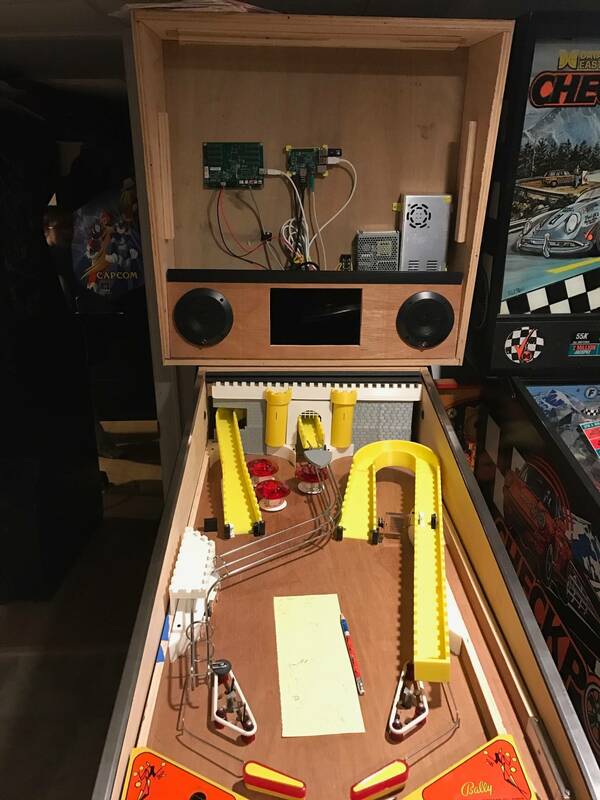 We then added some drop targets (from a mr and mrs pacman) and other figures as well as started placing the inserts to give us inspiration. You will also notice that we had swapped to a raspberry pi2 at this point. 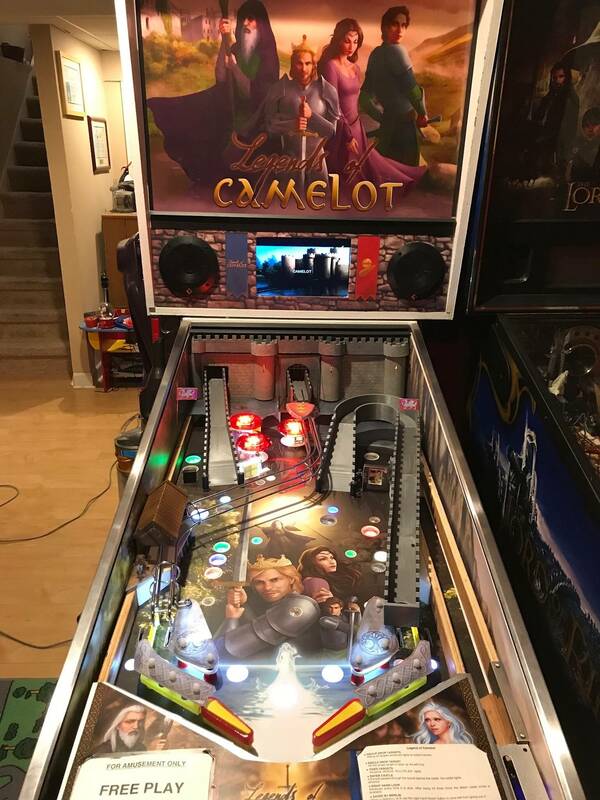 So we had a machine that worked well enough at this stage. 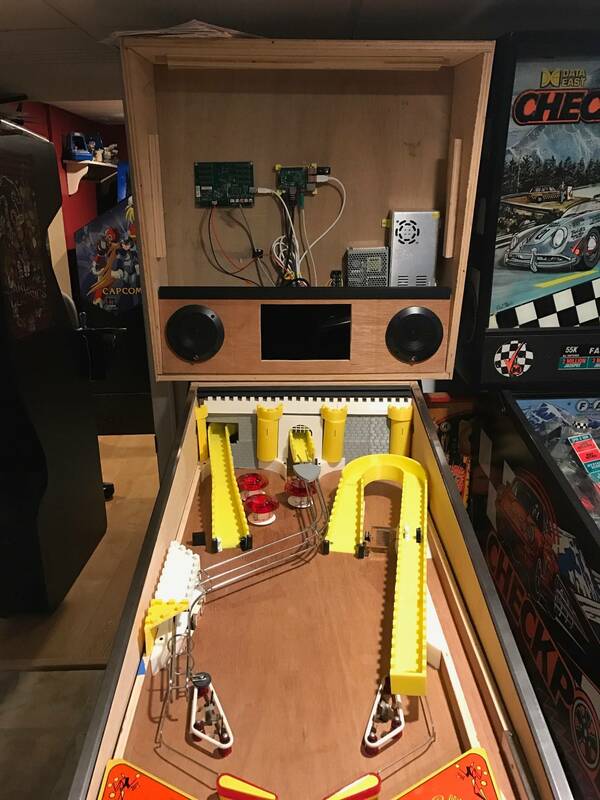 After a bit of time had passed (life tends to get in the way sometimes) we upgraded to a raspberry pi 3 and moved to new newer version of mission pinball. It was now no longer running X and was running the front end in Kivy. 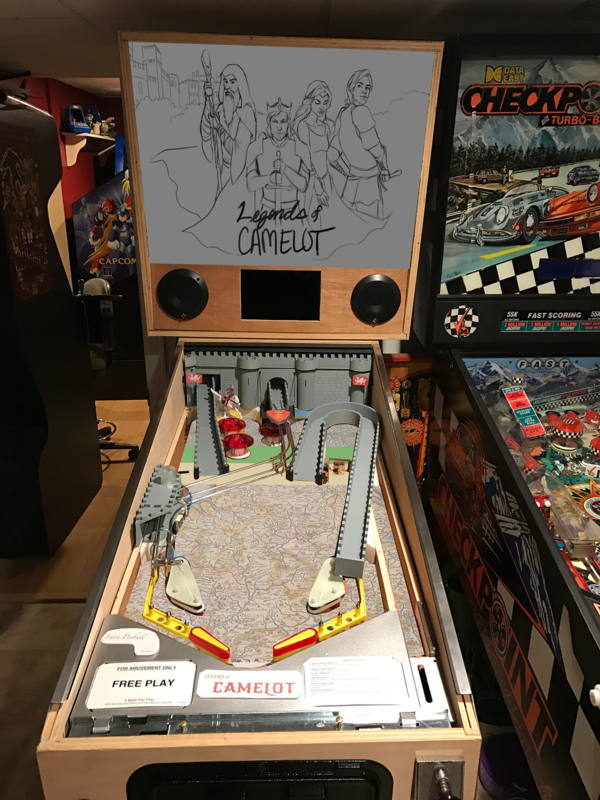 We decided to depart from our DMD like display to go with something different (not sure if this will stay or not) You will also notice that this has now been moved to the arcade room as we felt it was at least playable enough to warrant that. We also added a single stand up target and a spinner as well as some more decoration. We then continued on our autocad fusion 360 design / 3d printing journey. Its now starting to look more and more like a castle. I was cheap and was printing with whatever color I had in at the time. 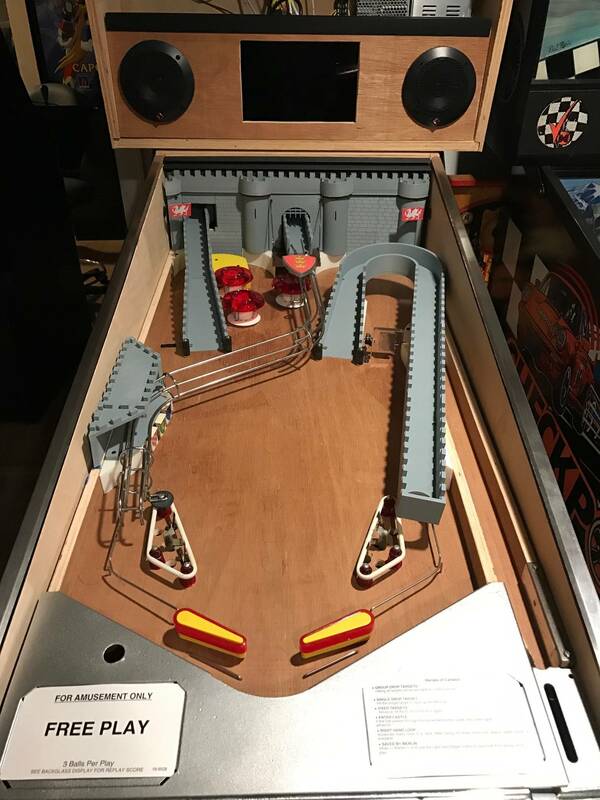 Notice the ramps that have the castle like tops on them. 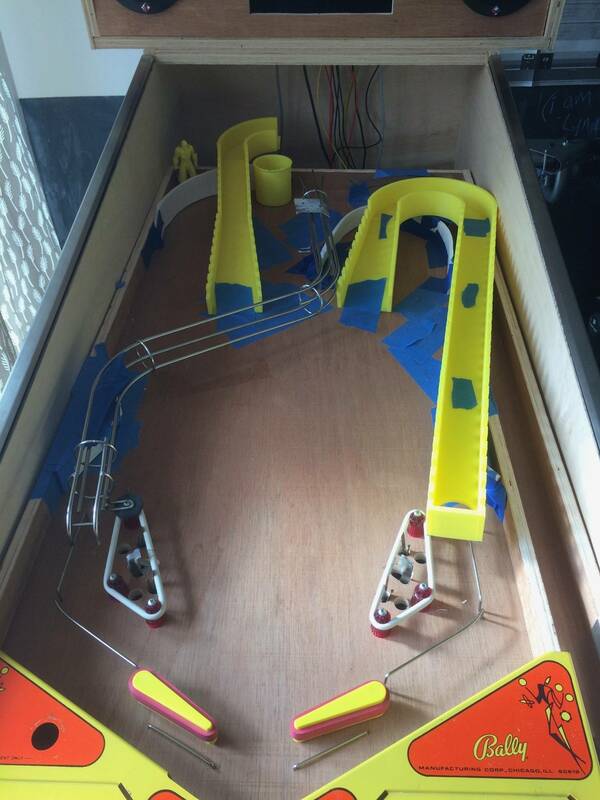 We still have not decided if the right ramp should be vacuum formed or remain as is. I think the left one will stay at least. We then moved on to clean up our crazy color scheme. Some Tamiya airplane paint and primer later and we ended up with at least something more uniform . Awesome!! 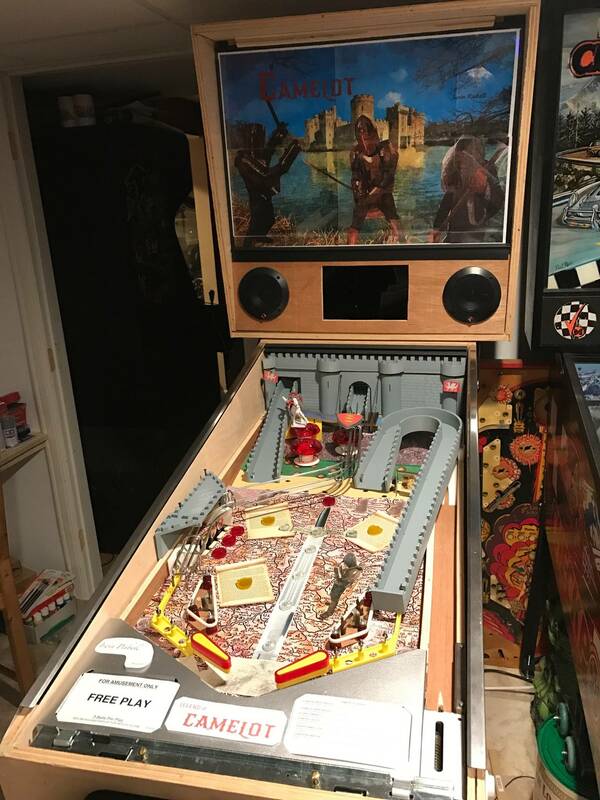 Looking be the ramp thru the back and out the castle, cool idea! We also worked on some other details to spruce up our drab grey. We also painted the drawbridge and added a chain for effect. We printed out a bunch of images ensuring to not use anything copyrighted. We kept adding as we went (and at this point we may make major changes to the art, we are truly not sure). The kids are really getting in to the store / modes etc. 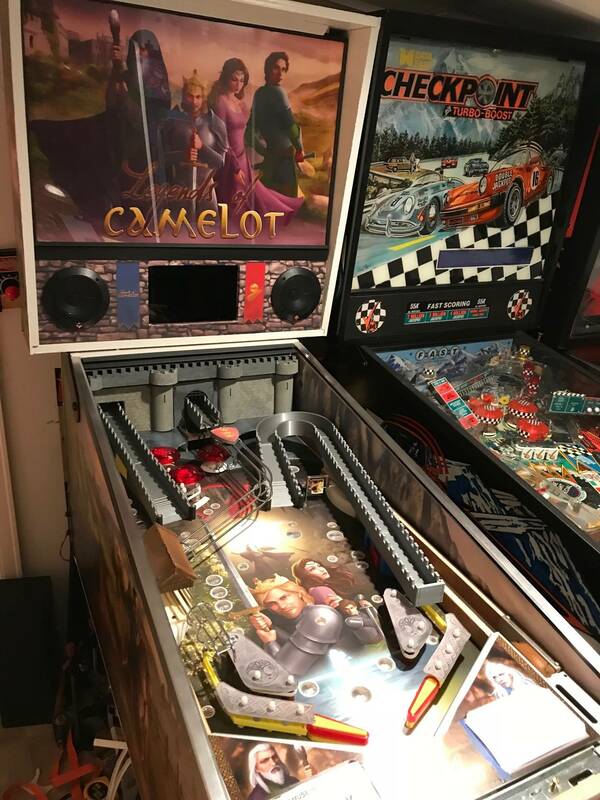 My 15 year old is working on all of the different modes based on the quests that the round table knights had. I do believe we will make the scrolls (which contain the stories of the knights) smaller and the map bigger. (more of a background piece) and see where that leads us. 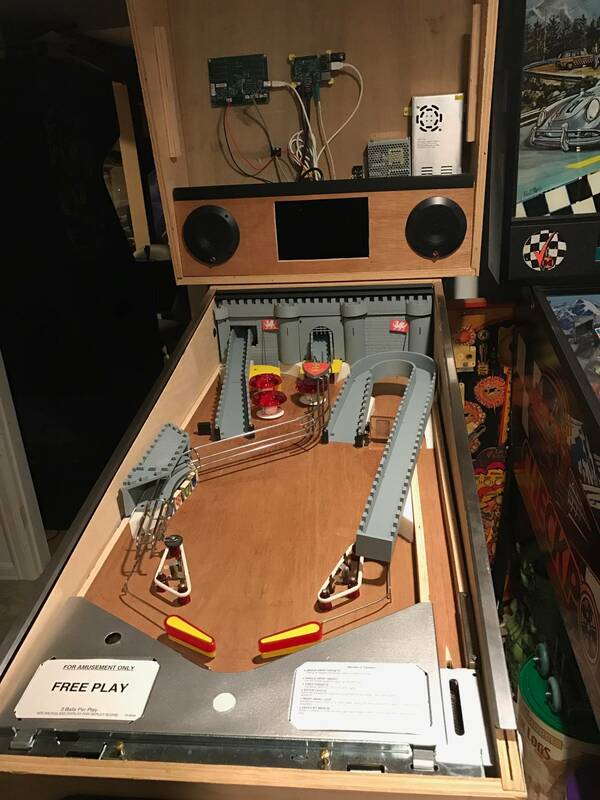 We also have a magnet in the playfield between the flippers as a ball saver (not working yet but at least in) at this point. 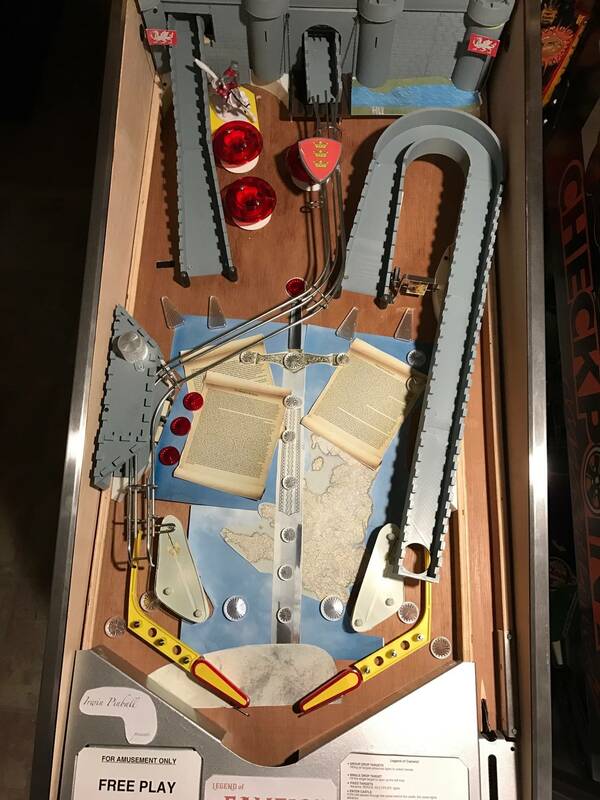 It is also not shown in all of the pictures but we have a pop up post on the back left side to stop the ball from being trapped behind the drop target. 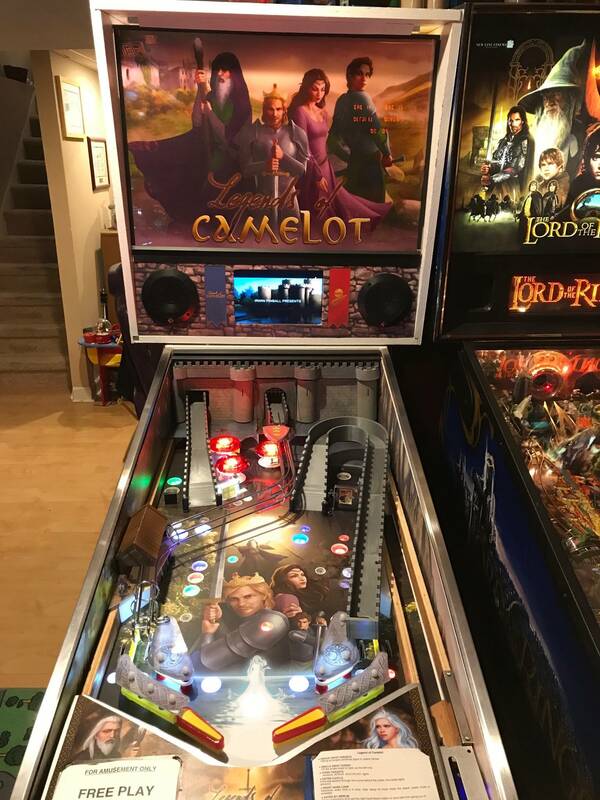 we still have not drilled for the inserts but I believe we all like the placement. 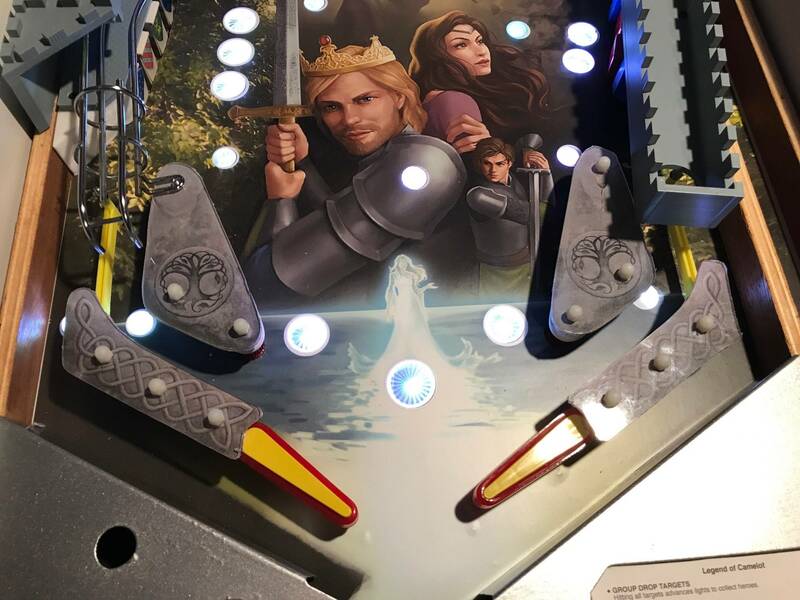 We have a holy grail image on the spinner as well. REminds me of the strong hold PC game. This is great! Exactly what our hobby is about bringing kids in and providing them with skills and confidence to help them grow into productive pinhead adults. As a Father myself your raising the bar for the rest of us. 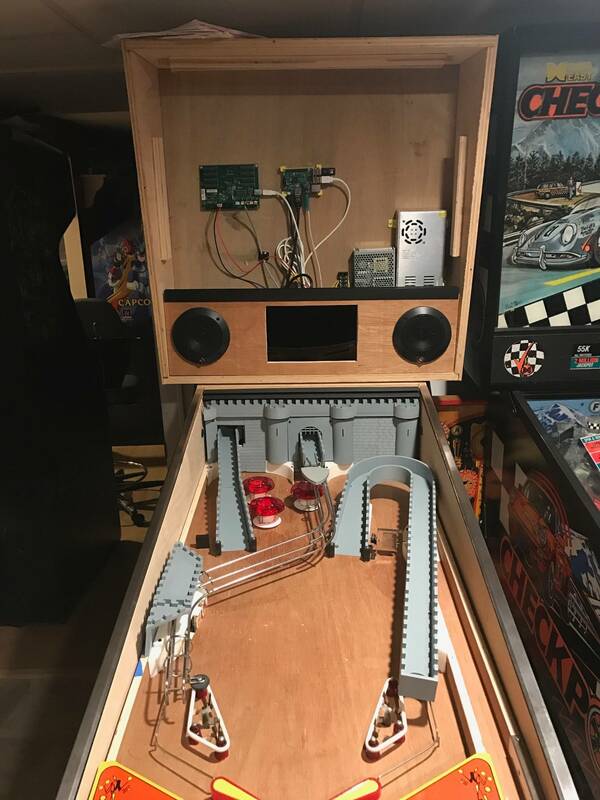 One awesome project. Ive added to my favorites. I will be following this thread closly. Looks fantastic so far!! Favorited! Super cool. Kids are gunna be wizards when they grow up! Thanks for the kind words of encouragement. The kids and I are going to work on the art this weekend... Will post updates soon. We have begun work on the art. It is subject to undergo vast changes but I wanted to post where we are. Right now its printed on a regular color laser printer (and taped together) so we can get a feel for what we like and don't. My older son was the model for the people on the back glass and play field. We have a ton more pictures (that we have not added the effects to as of yet) so its quite likely this will look drastically different. At least its a start and gives us an idea. I realize the artwork is by far our weakest skill. I could look for an artist but it would defeat the purpose of the kids and I working on it. That being said, it is my hope that it will improve as we change and refine the design. If not , then its at least something that was our own work. (even if everyone else thinks its terrible). 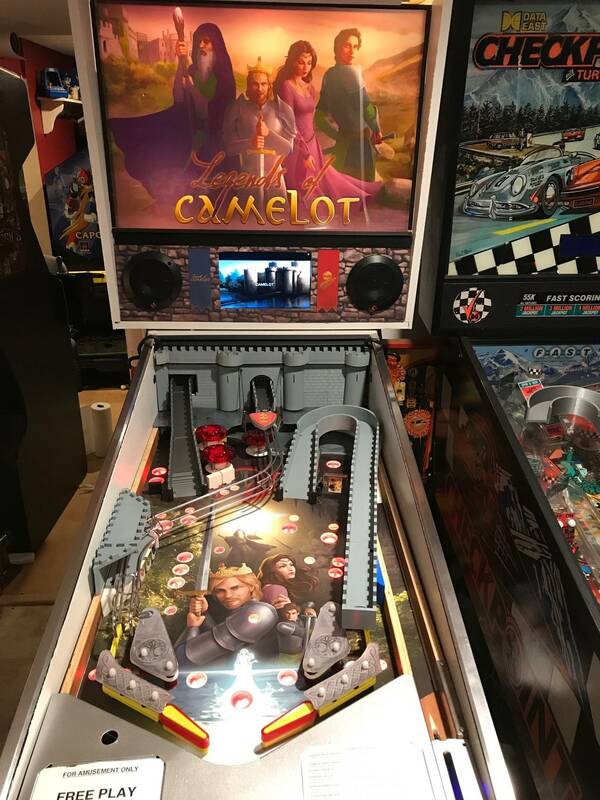 Bally made a pin named Camelot. 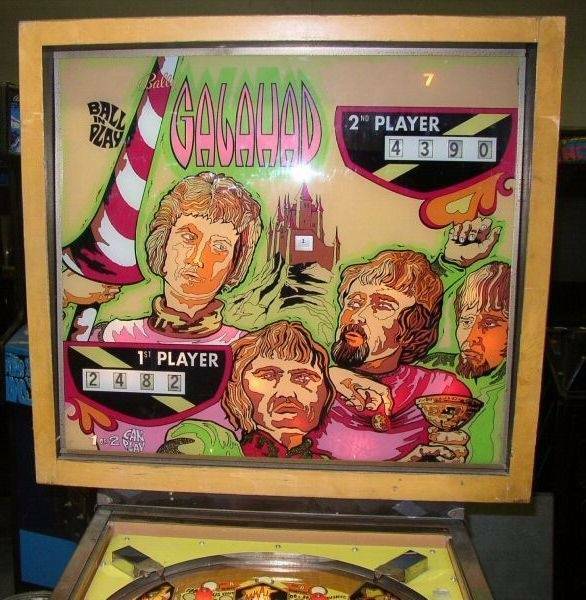 The two player version is Galahad. 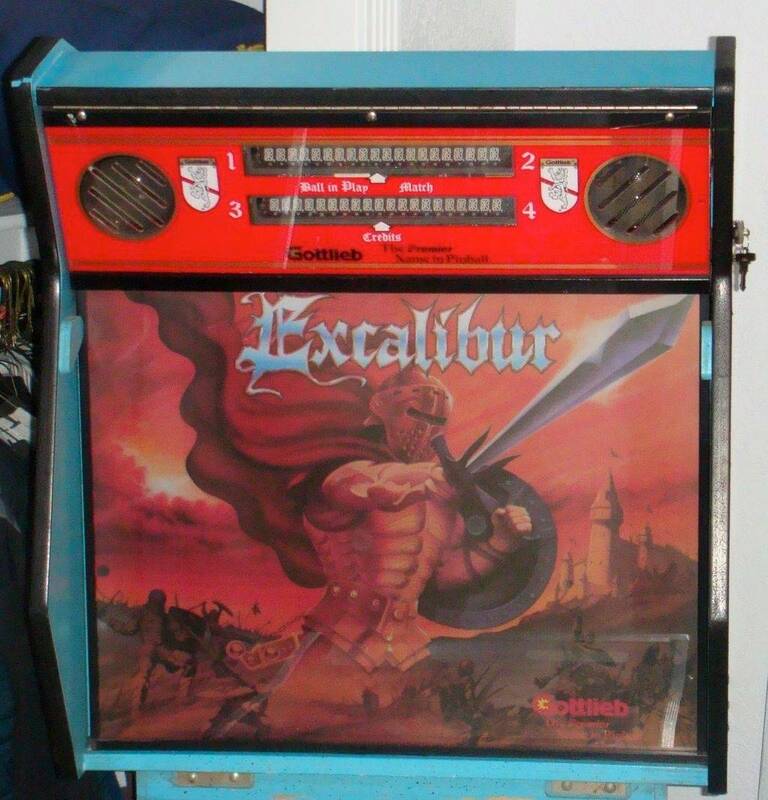 Bally Technologies used the Galahad name on a slot machine a few years ago. That shows they are keeping copyrights alive. Ok, I got it now. I would hope they would not go after a one off machine but who knows these days. Could always rename it. 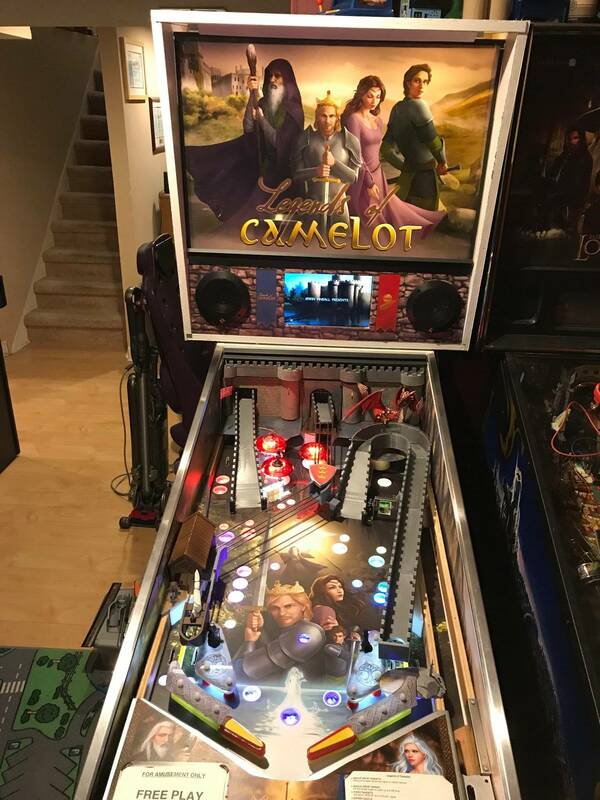 It actually says Legends of Camelot but its tough to read. There is probably nothing the days that someone does not have some sort of claim on. 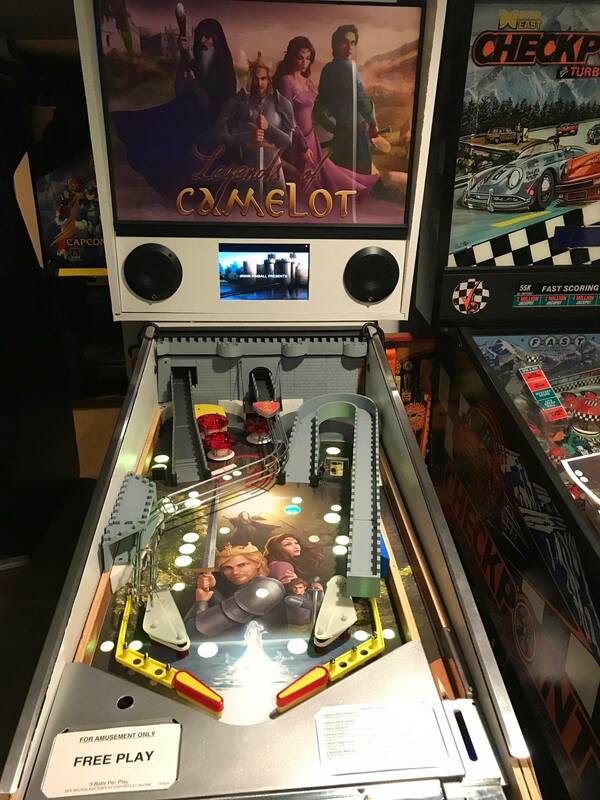 You can't copyright the name 'Camelot', but you can trademark it in relation to a company name or a specific product. 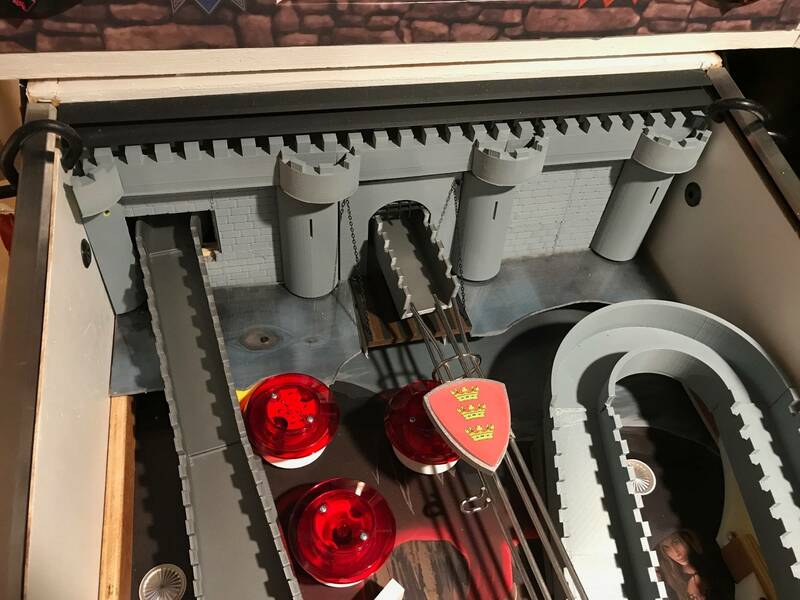 The 3D printed castle parts look so fantastic!! Very excited to see this take shape! As a one off home build, who cares who owns the rights to "whatever". Rick couldn't say a word even if he could figure out how too. 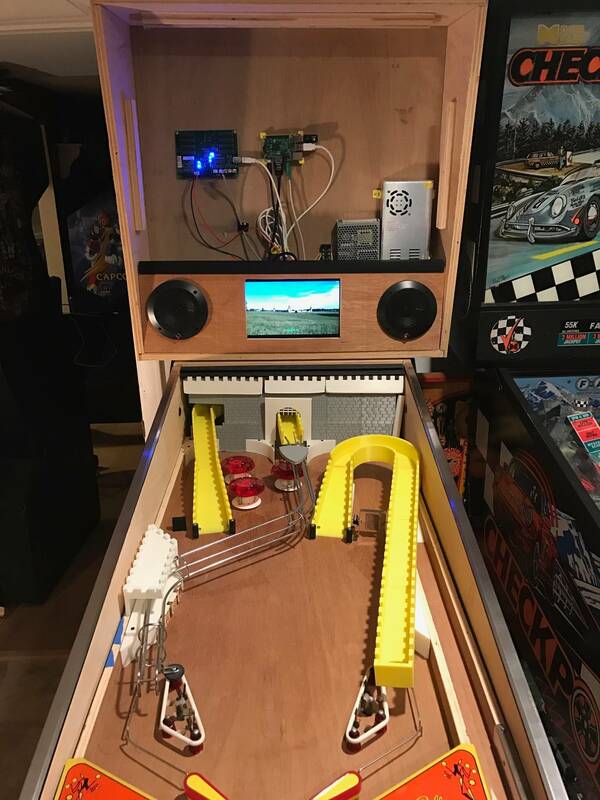 Fantastic project your building, I really wanted to try this myself but ended up selling the project machine. I wish you the best of luck completing it! Fantastic project- especially the part about doing this with your kids. 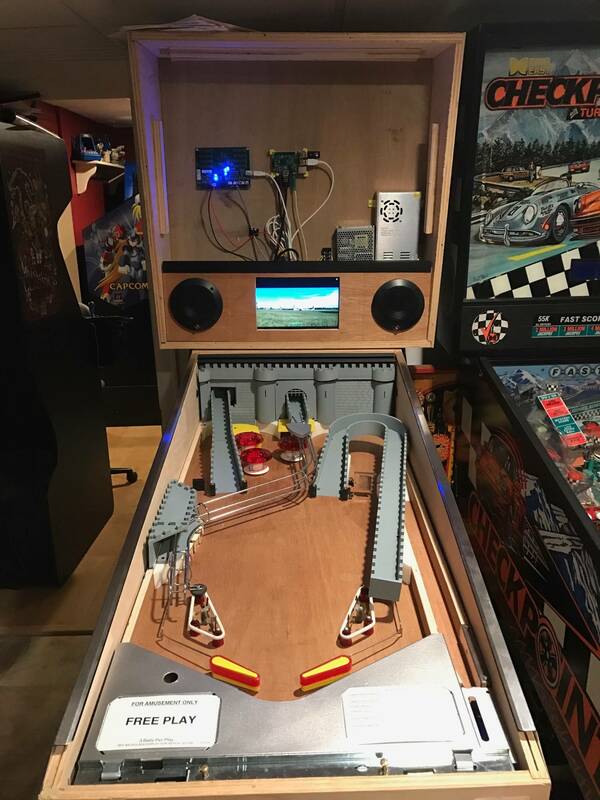 I have younger ones and we do "similar" things like buy a cool tonka truck and stop by the electronic shop on the way home and get a bunch of LEDs and proceed to rip the truck apart and drill holes, solder wires together -etc, and have built a rudimentary pinball machine (hand operated). I am so impressed with this- most excellent.. I love the art. Have fun with it and let the kids make it their own- who cares if it looks like this that or the other- fantastic looking. 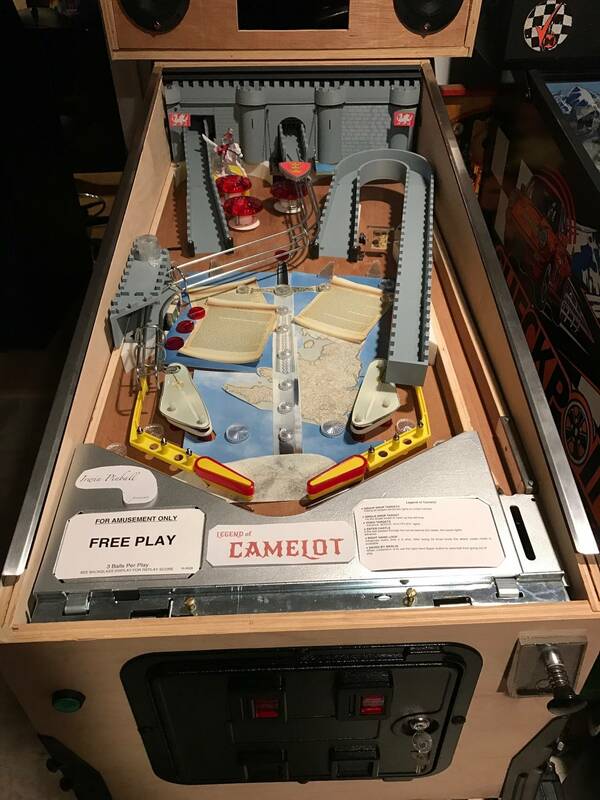 Wish I could play it after having the kids explain how it all works together. On the issue of art: y'all could just do the art yallselves, as you're doing, and just pay a freelance artist to redraw it as a singular spruced up image. The art design would still be the same, since y'all are the ones saying "hey this here, this here, looks like this, etc.," but would be "cleaned up" in the process of being redrawn and would be artwork owned by y'all. 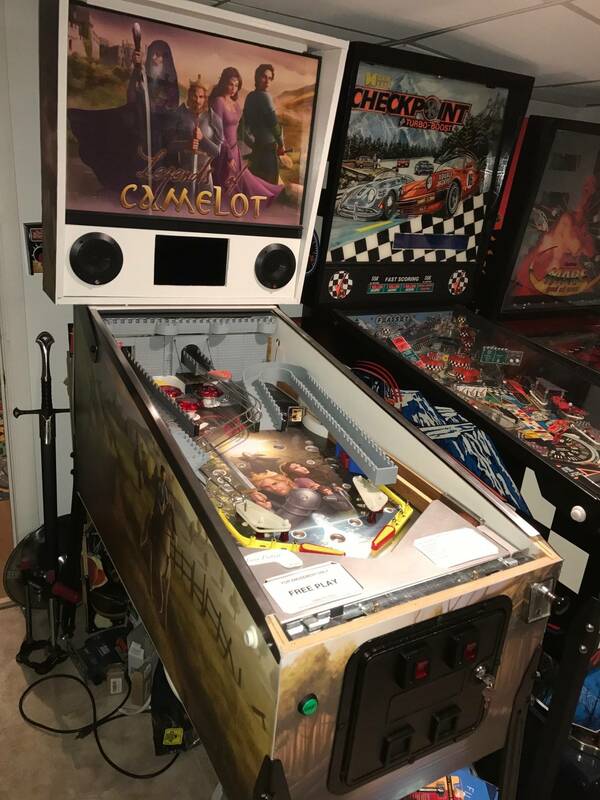 It's cost litigation more to issue a cease and desist order than anyone could claim "damages" for by a single home few game, if there was even a case to begin with. 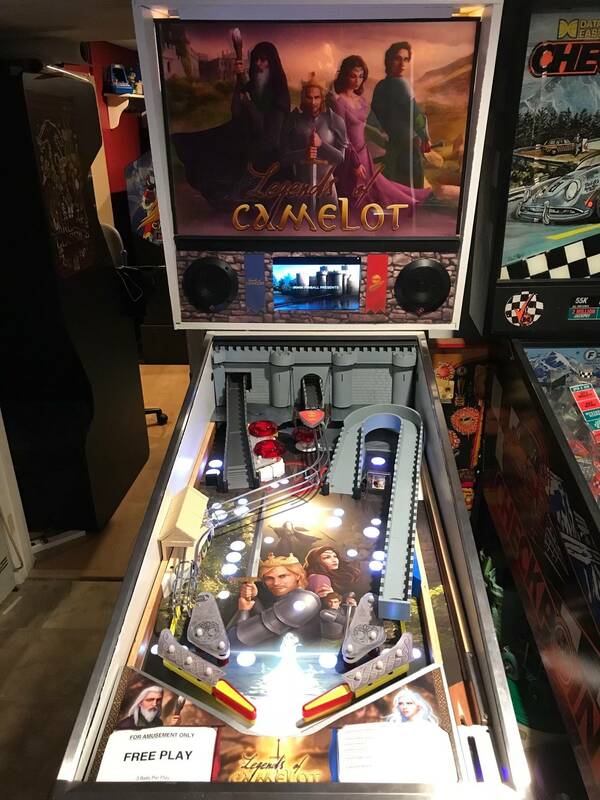 That said, there's no case; "Camelot themed pinball game" is far too generic to face any copyright issues. 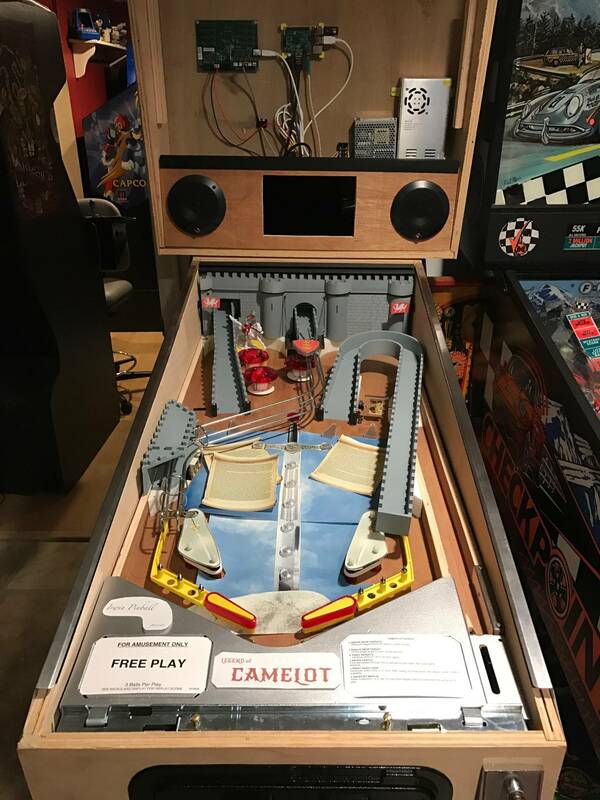 Wouldn't worry too much about using copyrighted images either, especially from outside of pinball stuff, as it's for personal use. Spent some more time on the artwork (or rather how we are attempting apply it). 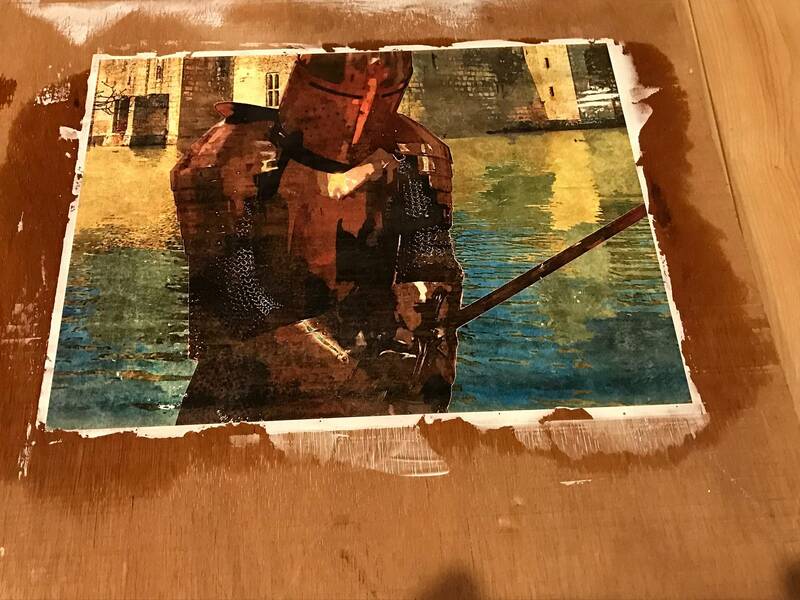 We used a product made for arts and crafts called Mod Podge Photo transfer medium. Basically you reverse print what you want on a laser printer , coat the toner side of the paper then use a roller to smoothly apply it (toner side down) to the wood. Once it dries for a day , you wet the paper then rub the paper off revealing the image. We did single sheet yesterday and the results are encouraging. The end result can be cleared so we (in theory) should be able to get a decently strong finish. Here is our first attempt. Note the toner is directly on the wood now (not a piece of paper glued to the wood). The finish feels pretty smooth, actually better than I expected. We used the existing Backglass art we made for the first pass. We also have a second experiment with 2 sheets of paper taped together. Less optimistic about that one but want to see the results ( I assume there will be a visible line) It is currently drying. 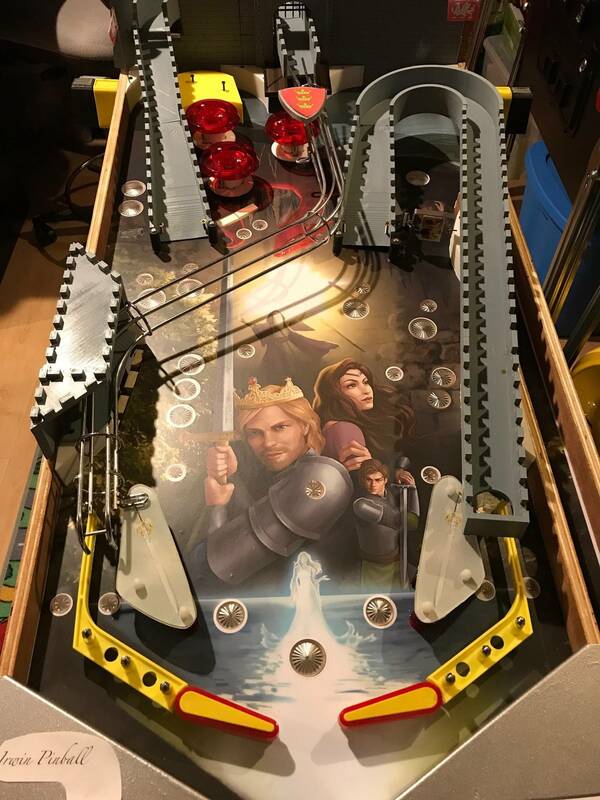 If the tape method does not work the plan is to use the laser art for the play field but strategically have separator lines that can be air brushed in creating a seamless image. Will post updates with the results. I guess now I can add general arts and crafts to the skills the kids are being exposed to . Hey, that's cool! I'll have to remember that. 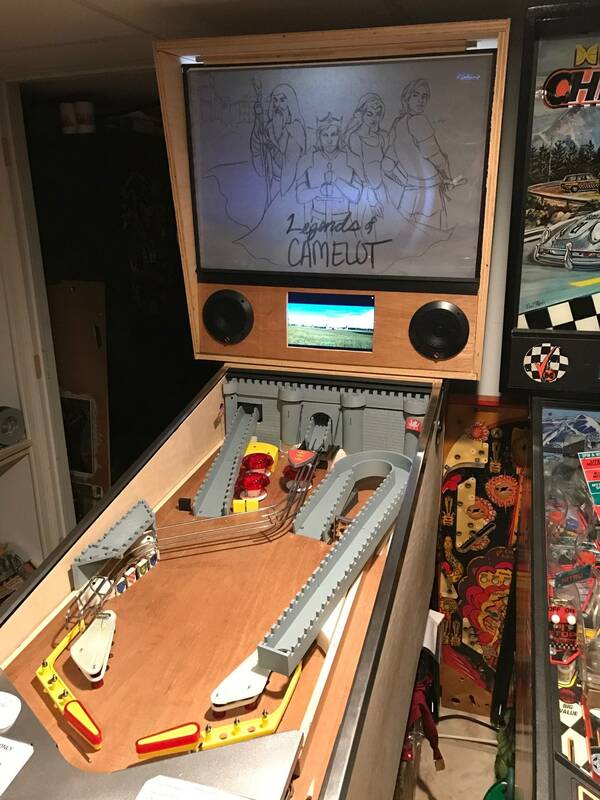 I love the castle ramps too. Agreed. As long as you dont sell it. Personal home use you will be ok. And its highly unlikely anything would happen even if you did. Unless you make 100's or thousands of units for sell. Currently, Im retheming a HS2 into Cars for my son. Pinsound card really helps! The area I find most interesting about this home build is the OP did more work in two weeks that JPoP did in 5+ years. License copyrights are not relevant, unless a game is sold publicly for profit. 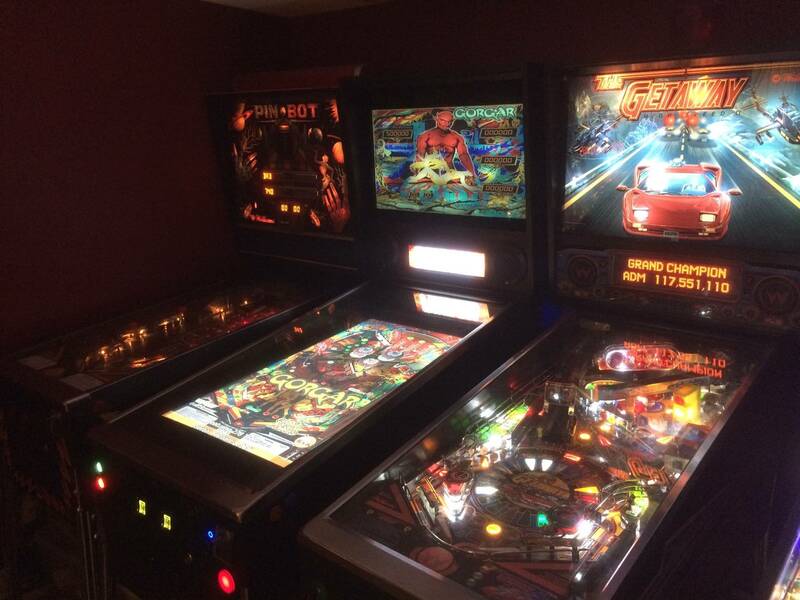 You can wallpaper your house with photo copies of pinball artwork. Just do the work yourself. There are a few other games from foreign manufacturers as well than these titles shown below. 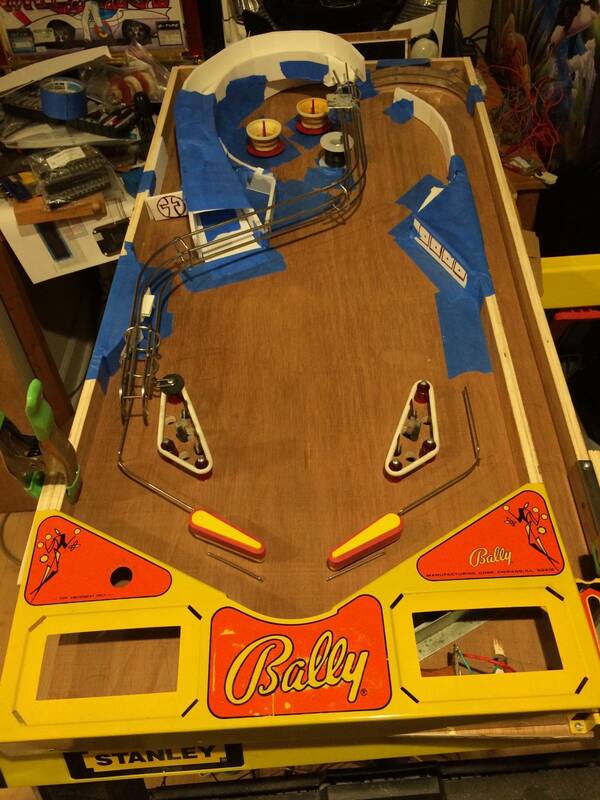 Here is an update of where we are as far as play field art design. 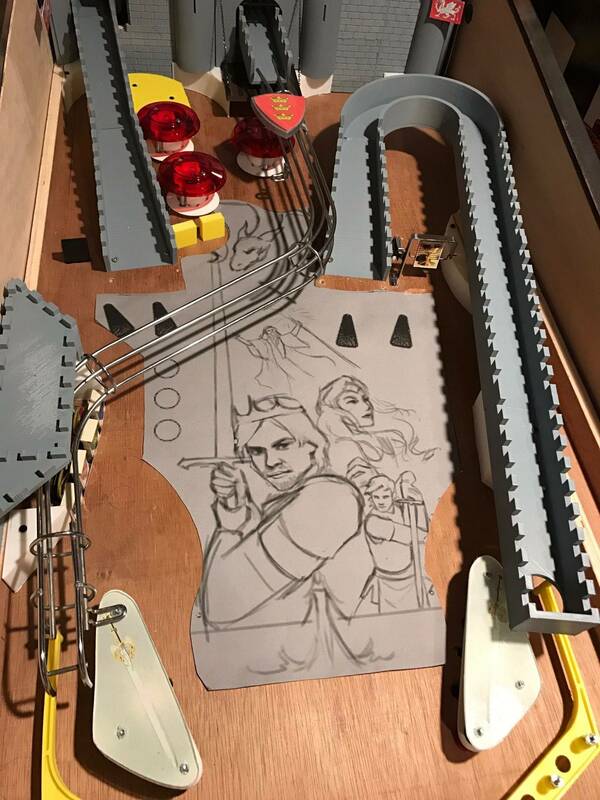 (with some of the kids old toys thrown in for added effect) It is still just printed out on laser printer and laid down on the wood but I think it still gives us a good idea. While I personally think we are improving the overall design we have decided to look to a professional artist to assist us in our creation. We have found a person with the style that seems to fit the machine and we all agree on. (Hopefully she will want to assist) Will keep making revisions on our own but we are excited for the new possibilities. Good call on getting an artist to help you guys out. You are spending a ton of time building the thing, might as well make it look good! I like it. What's your estimated time and money invested into it thus far, out of curiosity? Here is what I have. (had some parts already) Controller was the most expensive single part I bought. 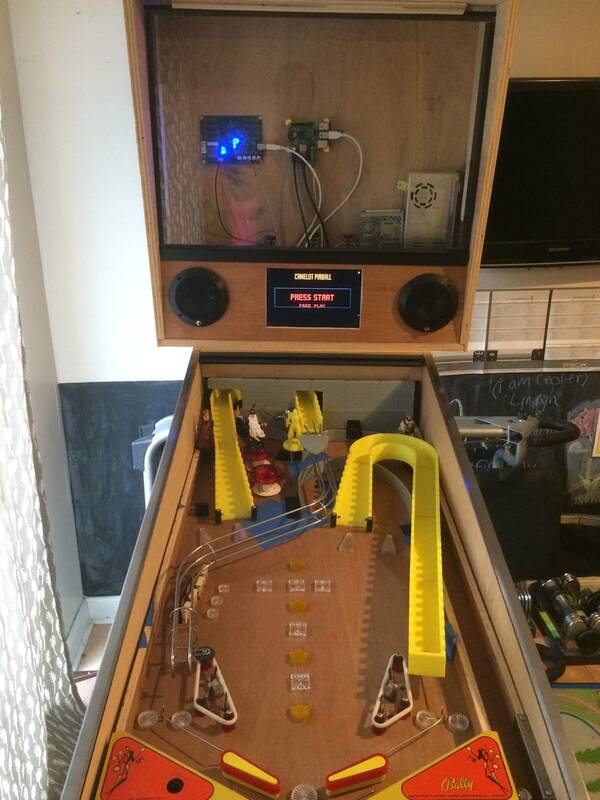 Could have used my homemade boards (and figured out the idiosyncrasies) or gone with open pinball project. 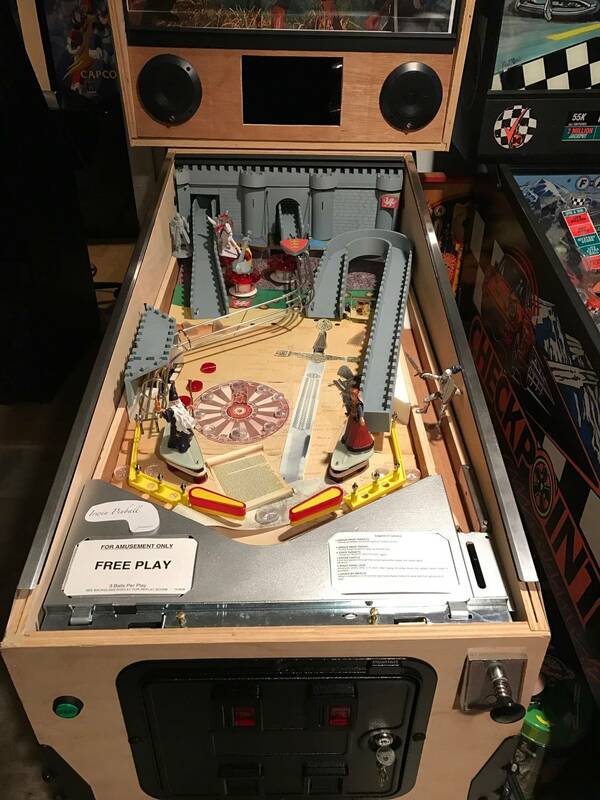 I think this list is pretty inclusive but there are various screws and posts I used as well (most I had from other repairs / projects etc) I actually bought a complete firepower II play field to rob of parts but it was actually too nice once I had it that it will become my next project. I was able to acquire a perfect backglass already for it. 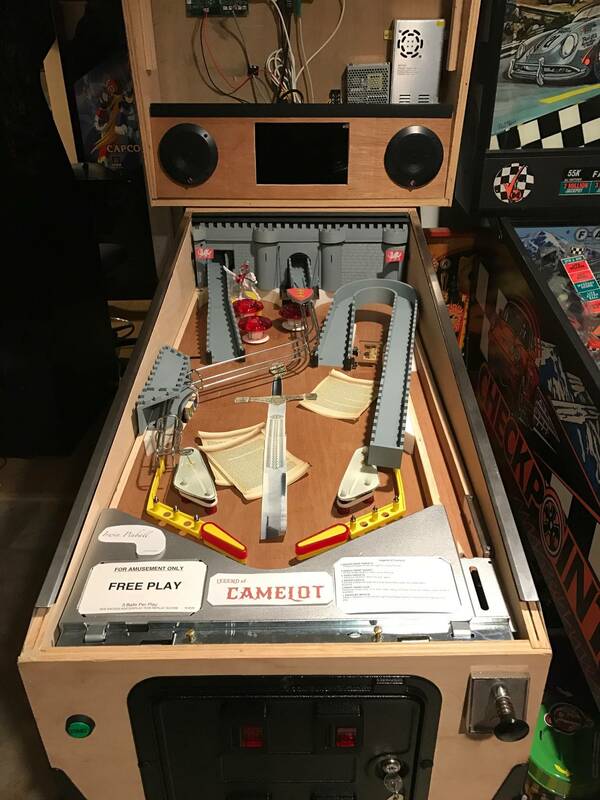 Would have been cheaper option ($120 for whole playfield) I also build a visual pinball cabinet prior to this and had some part / experience from that to help me along. Here is a pic of that one. Just a quick update. We did select an artist (as stated earlier) and we came to an agreement on terms , what we are looking for , etc. She is currently working on the sketches and I will update the progress as it comes. Starting with the backglass first. Wanted to do another update on where we were. Here is an image of the initial sketch of the backglass art that I 'shopped onto an existing picture of our game. Stephanie, the artist we are working with (https://www.offbeatworlds.com) has done an amazing job capturing what we were looking for. 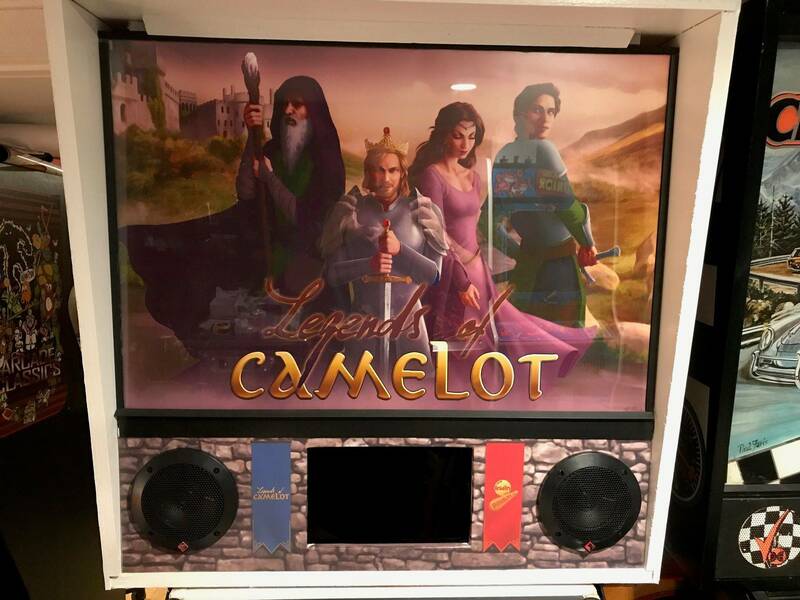 Still need to get the final art for the backglass and start work on the play field (the play field that is there is still the design from the kids and me) but I think this starts to show what the final game will become. 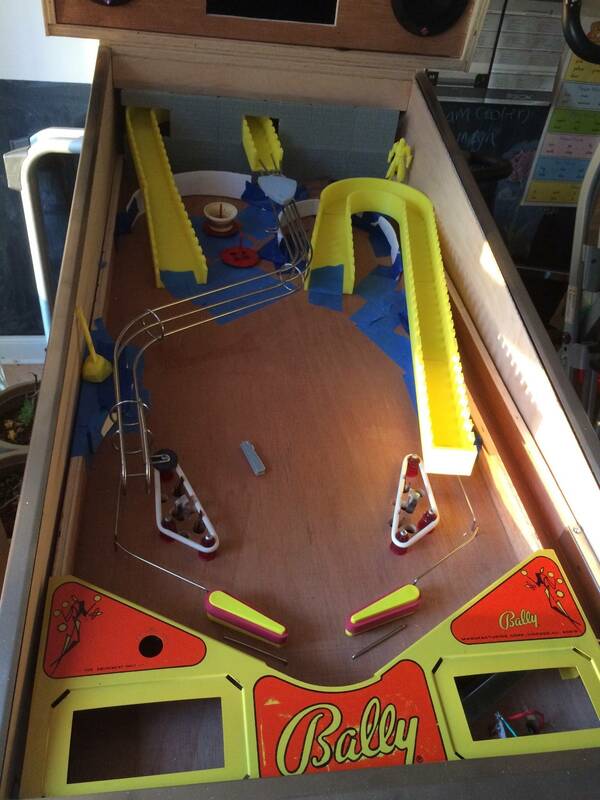 We have also decided to add a 2 drop target bank in front of the pop bumper to the right of the left ramp. Should be installing int soon. 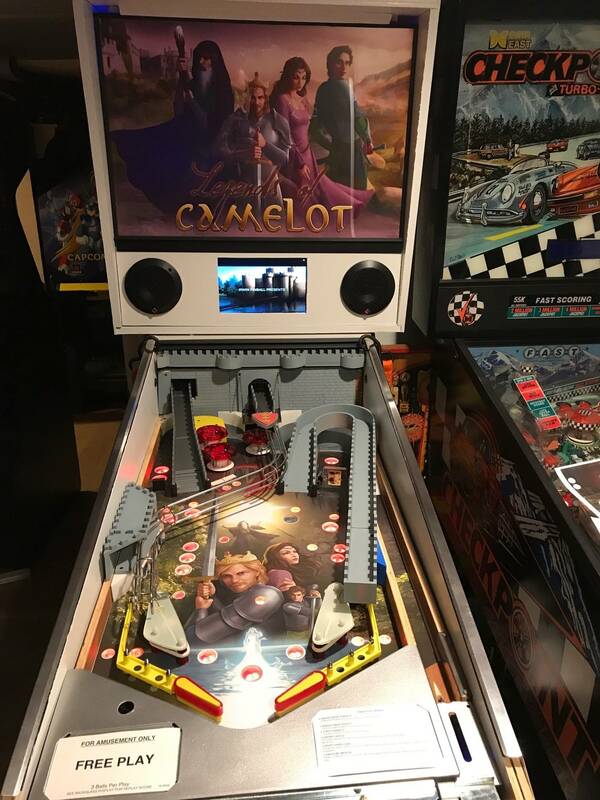 We are also still considering replacing the right castle ramp with a vacuum formed one. Looks great! Nice to see the progress being made! Artwork is going to be rad I can tell already. Looking good! Thanks to all for the positive feedback! We are open to other suggestions if you guys have them. Not a huge update but I had the sketch printed on a large format printer (plain paper for now but plan to go to back light material for final) . 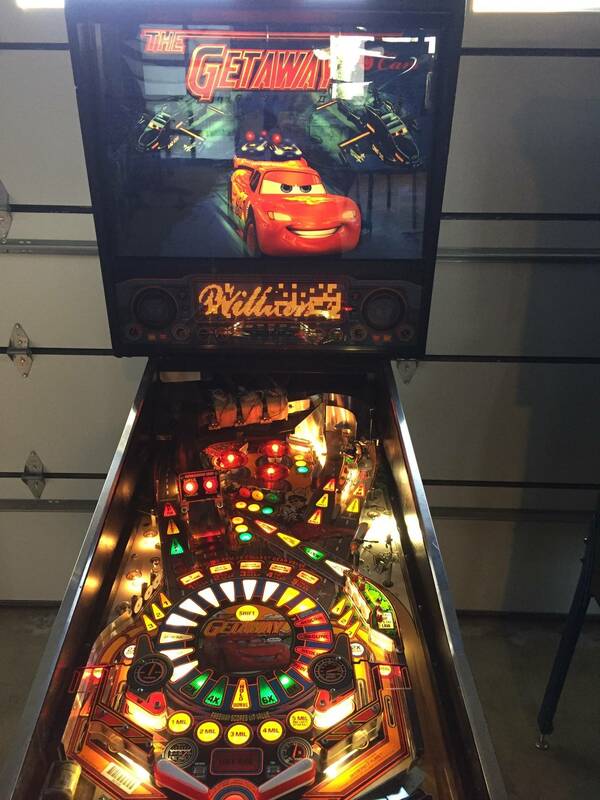 Kids and I have been experimenting with placement of LED's and possible running some effects on the image with that. (maybe make merlins staff light up or something) Will be cool to see it in color. Hello, this is the eldest of the two children of matirwin posting on pinside for the first time. 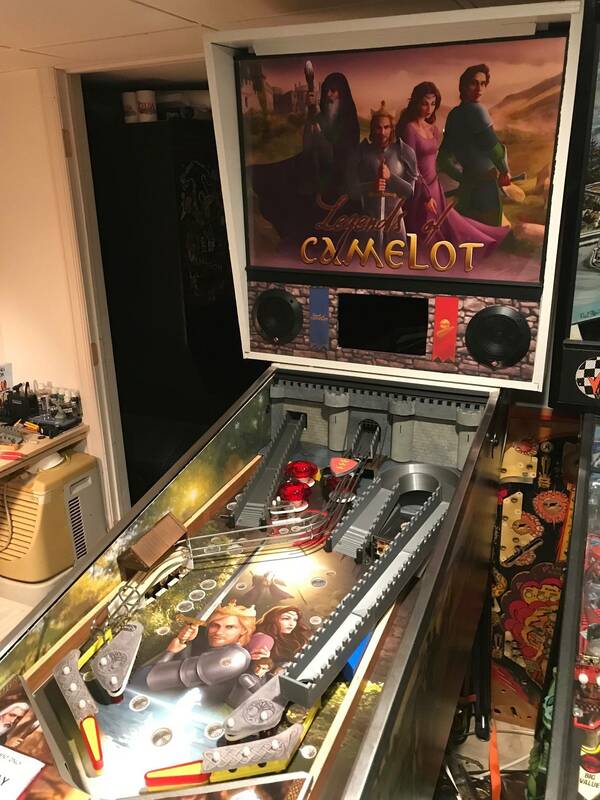 I'm bringing you an update on the table. ...And it's awesome. 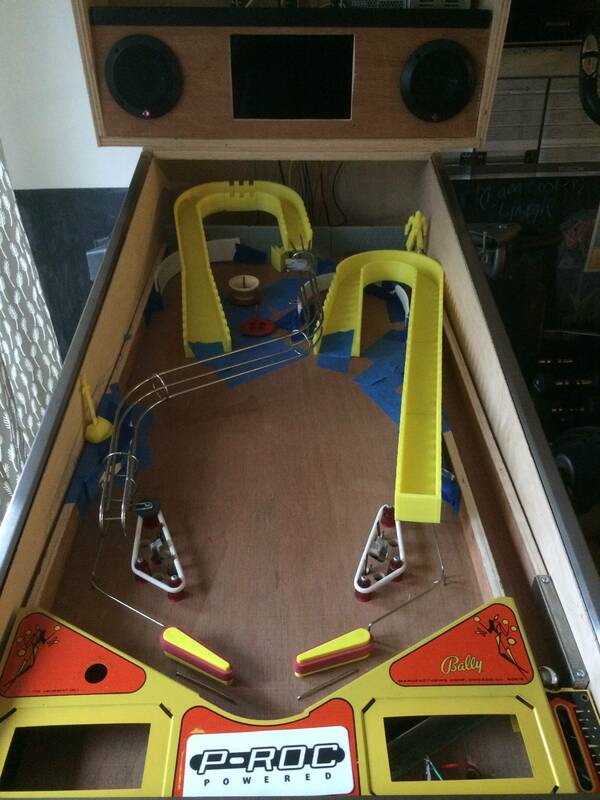 Anyways, we are working on putting the rough playfield art on now. I will keep you posted, folks. Sweet! 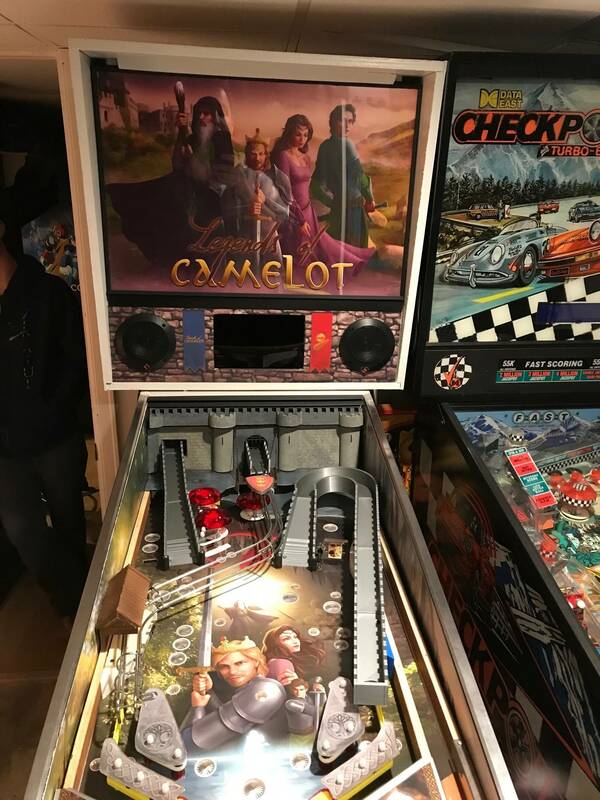 I like it, as well as the machine, even without art! Hey guys, this is the eldest again (officially posting through Solis_Prime for the first time). 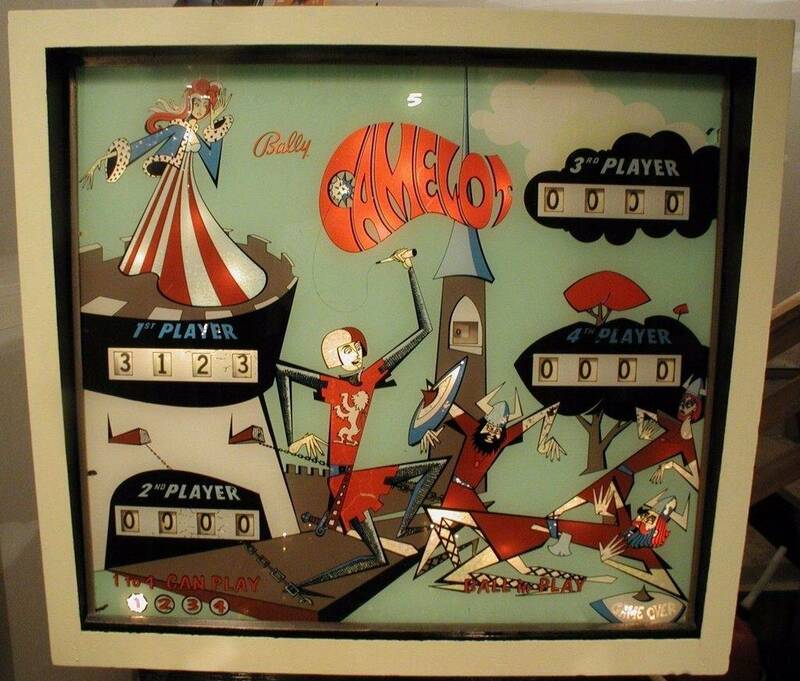 As promised, here is the playfield art. Man, I can't wait to see this colored. 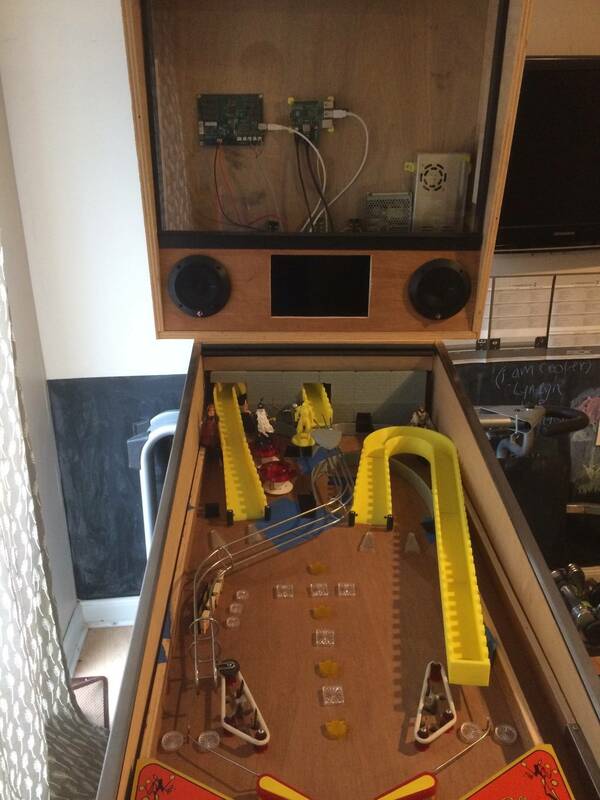 This project just continues to get cooler and cooler. Also, I just want to let you guys know that the colorized backglass art is not the final, just a colorized rough sketch. I am really excited for the final art.